The Romans constructed aqueducts throughout their Republic and later Empire, to bring water from outside sources into cities and towns. Aqueduct water supplied public baths, latrines, fountains, and private households; it also supported mining operations, milling, farms, and gardens. Aqueducts moved water through gravity alone, along a slight overall downward gradient within conduits of stone, brick, or concrete; the steeper the gradient, the faster the flow. Most conduits were buried beneath the ground and followed the contours of the terrain; obstructing peaks were circumvented or, less often, tunneled through. Where valleys or lowlands intervened, the conduit was carried on bridgework, or its contents fed into high-pressure lead, ceramic, or stone pipes and siphoned across. Most aqueduct systems included sedimentation tanks, which helped reduce any water-borne debris. Sluices and castella aquae (distribution tanks) regulated the supply to individual destinations. In cities and towns, the run-off water from aqueducts scoured the drains and sewers. Rome's first aqueduct was built in 312 BC, and supplied a water fountain at the city's cattle market. By the 3rd century AD, the city had eleven aqueducts, sustaining a population of over a million in a water-extravagant economy; most of the water supplied the city's many public baths. Cities and towns throughout the Roman Empire emulated this model, and funded aqueducts as objects of public interest and civic pride, "an expensive yet necessary luxury to which all could, and did, aspire". Most Roman aqueducts proved reliable and durable; some were maintained into the early modern era, and a few are still partly in use. Methods of aqueduct surveying and construction are noted by Vitruvius in his work De Architectura (1st century BC). The general Frontinus gives more detail in his official report on the problems, uses and abuses of Imperial Rome's public water supply. Notable examples of aqueduct architecture include the supporting piers of the Aqueduct of Segovia, and the aqueduct-fed cisterns of Constantinople. "The extraordinary greatness of the Roman Empire manifests itself above all in three things: the aqueducts, the paved roads, and the construction of the drains." Before the development of aqueduct technology, Romans, like most of their contemporaries in the ancient world, relied on local water sources such as springs and streams, supplemented by groundwater from privately or publicly owned wells, and by seasonal rain-water drained from rooftops into storage jars and cisterns. The reliance of ancient communities upon such water resources restricted their potential growth. Rome's aqueducts were not strictly Roman inventions – their engineers would have been familiar with the water-management technologies of Rome's Etruscan and Greek allies – but they proved conspicuously successful. By the early Imperial era, the city's aqueducts supported a population of over a million, and an extravagant water supply for public amenities had become a fundamental part of Roman life. The run-off of aqueduct water scoured the sewers of cities and towns. Water from aqueducts was also used to supply villas, ornamental urban and suburban gardens, market gardens, farms, and agricultural estates, the latter being the core of Rome's economy and wealth. Rome had several springs within its perimeter walls but its groundwater was notoriously unpalatable; water from the river Tiber was badly affected by pollution and waterborne diseases. The city's demand for water had probably long exceeded its local supplies by 312 BC, when the city's first aqueduct, the Aqua Appia, was commissioned by the censor Appius Claudius Caecus. The Aqua Appia was one of two major public projects of the time; the other was a military road between Rome and Capua, the first leg of the so-called Appian Way. Both projects had significant strategic value, as the Third Samnite War had been under way for some thirty years by that point. The road allowed rapid troop movements; and by design or fortunate coincidence, most of the Aqua Appia ran within a buried conduit, relatively secure from attack. It was fed by a spring 16.4 km from Rome, and dropped 10 metres over its length to discharge approximately 75,500 cubic metres of water each day into a fountain at Rome's cattle market, the Forum Boarium, one of the city's lowest-lying public spaces. A second aqueduct, the Aqua Anio Vetus, was commissioned some forty years later, funded by treasures seized from Pyrrhus of Epirus. Its flow was more than twice that of the Aqua Appia, and it entered the city on raised arches, supplying water to higher elevations of the city. By 145 BC, the city had again outgrown its combined supplies. An official commission found the aqueduct conduits decayed, their water depleted by leakage and illegal tapping. The praetor Quintus Marcius Rex restored them, and introduced a third, "more wholesome" supply, the Aqua Marcia, Rome's longest aqueduct and high enough to supply the Capitoline Hill. The works cost 180,000,000 sesterces, and took two years to complete. As demand grew still further, more aqueducts were built, including the Aqua Tepula in 127 BC and the Aqua Julia in 33 BC. Aqueduct-building programmes reached a peak in the Imperial Era. Augustus' reign saw the building of the Aqua Virgo, and the short Aqua Alsietina that supplied Trastevere with large quantities of non-potable water for its gardens and to create an artificial lake for staged sea-fights to entertain the populace. Another short Augustan aqueduct supplemented the Aqua Marcia with water of "excellent quality". The emperor Caligula added or began two aqueducts completed by his successor Claudius; the 69 km (42.8 mile) Aqua Claudia, which gave good quality water but failed on several occasions; and the Anio Novus, highest of all Rome's aqueducts and one of the most reliable but prone to muddy, discoloured waters, particularly after rain, despite its use of settling tanks. Most of Rome's aqueducts drew on various springs in the valley and highlands of the Anio, the modern river Aniene, east of the Tiber. A complex system of aqueduct junctions, tributary feeds and distribution tanks supplied every part of the city. Trastevere, the city region west of the Tiber, was primarily served by extensions of several of the city's eastern aqueducts, carried across the river by lead pipes buried in the roadbed of the river bridges, thus forming an inverted siphon. Whenever this cross-river supply had to be shut down for routine repair and maintenance works, the "positively unwholesome" waters of the Aqua Alsietina were used to supply Trastevere's public fountains. The situation was finally ameliorated when the emperor Trajan built the Aqua Traiana in 109 AD, bringing clean water directly to Trastavere from aquifers around Lake Bracciano. By the late 3rd century AD, the city was supplied with water by 11 state-funded aqueducts. Their combined conduit length is estimated between 780 and a little over 800 kilometres, of which approximately 47 km (29 mi) were carried above ground level, on masonry supports. They supplied around 1 million cubic metres (300 million gallons) a day: a capacity 126% of the current[when?] water supply of the city of Bangalore, which has a population of 10 million. Hundreds of similar aqueducts were built throughout the Roman Empire. Many of them have since collapsed or been destroyed, but a number of intact portions remain. The Zaghouan Aqueduct is 92.5 km (57.5 mi) in length. It was built in the 2nd century to supply Carthage (in modern Tunisia). Surviving aqueduct bridges include the Pont du Gard in France and the Aqueduct of Segovia in Spain. The longest single conduit, at over 240 km, is associated with the Valens Aqueduct of Constantinople (Mango 1995). "The known system is at least two and half times the length of the longest recorded Roman aqueducts at Carthage and Cologne, but perhaps more significantly it represents one of the most outstanding surveying achievements of any pre-industrial society". Rivalling this in terms of length and possibly equaling or exceeding it in cost and complexity, is the provincial Aqua Augusta that supplied an entire region, which contained at least eight cities, including the major ports at Naples and Misenum; sea voyages by traders and the Roman navy required copious supplies of fresh water. Whether state-funded or privately built, aqueducts were protected and regulated by law. Any proposed aqueduct had to be submitted to the scrutiny of civil authorities. Permission (from the senate or local authorities) was granted only if the proposal respected the water rights of other citizens; on the whole, Roman communities took care to allocate shared water resources according to need. The land on which a state-funded aqueduct was built might be state land (ager publicus) or privately owned, but in either case was subject to restrictions on usage and encroachment that might damage the fabric of the aqueduct. To this end, state funded aqueducts reserved a wide corridor of land, up to 15 feet each side of the aqueduct's outer fabric. Ploughing, planting and building were prohibited within this boundary. Such regulation was necessary to the aqueduct's long-term integrity and maintenance but was not always readily accepted or easily enforced at a local level, particularly when ager publicus was understood to be common property. Some privately built or smaller municipal aqueducts may have required less stringent and formal arrangements. Springs were by far the most common sources for aqueduct water; for example, most of Rome's supply came from various springs in the Anio valley and its uplands. 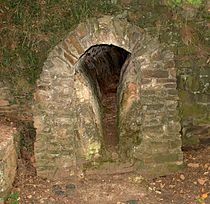 Spring-water was fed into a stone or concrete springhouse, then entered the aqueduct conduit. Scattered springs would require several branch conduits feeding into a main channel. Some systems drew water from open, purpose-built, dammed reservoirs, such as the two (still in use) that supplied the aqueduct at the provincial city of Emerita Augusta. The territory over which the aqueduct ran had to be carefully surveyed to ensure the water would flow at an acceptable gradient for the entire distance. Roman engineers used various surveying tools to plot the course of aqueducts across the landscape. They checked horizontal levels with a chorobates, a flatbedded wooden frame fitted with a water level. They plotted courses and angles could be plotted and checked using a groma, a relatively simple apparatus that was probably displaced by the more sophisticated dioptra, precursor of the modern theodolite. In Book 8 of his De Architectura, Vitruvius describes the need to ensure a constant supply, methods of prospecting, and tests for potable water. Greek and Roman physicians knew the association between stagnant or tainted waters and water-borne disease. They also knew the adverse health effects of lead on those who mined and processed it, and for this reason, ceramic pipes were preferred over lead. Where lead pipes were used, a continuous water-flow and the inevitable deposition of water-borne minerals within the pipes somewhat reduced the water's contamination by soluble lead. Nevertheless, the level of lead in this water was 100 times higher than in local spring waters. Most Roman aqueducts were flat-bottomed, arch-section conduits that ran 0.5 to 1 m beneath the ground surface, with inspection-and-access covers at regular intervals. Conduits above ground level were usually slab-topped. Early conduits were ashlar-built but from around the late Republican era, brick-faced concrete was often used instead. The concrete used for conduit linings was usually waterproof. The flow of water depended on gravity alone. The volume of water transported within the conduit depended on the catchment hydrology – rainfall, absorption, and runoff – the cross section of the conduit, and its gradient; most conduits ran about two-thirds full. The conduit's cross section was also determined by maintenance requirements; workmen must be able to enter and access the whole, with minimal disruption to its fabric. Vitruvius recommends a low gradient of not less than 1 in 4800 for the channel, presumably to prevent damage to the structure through erosion and water pressure. This value agrees well with the measured gradients of surviving masonry aqueducts. The gradient of the Pont du Gard is only 34 cm per km, descending only 17 m vertically in its entire length of 50 km (31 mi): it could transport up to 20,000 cubic metres a day. The gradients of temporary aqueducts used for hydraulic mining could be considerably greater, as at Dolaucothi in Wales (with a maximum gradient of about 1:700) and Las Medulas in northern Spain. Where sharp gradients were unavoidable in permanent conduits, the channel could be stepped downwards, widened or discharged into a receiving tank to disperse the flow of water and reduce its abrasive force. The use of stepped cascades and drops also helped re-oxygenate and thus "freshen" the water. The arches of an elevated section of the Roman provincial Aqueduct of Segovia, in modern Spain. Some aqueduct conduits were supported across valleys or hollows on arches of masonry, brick or concrete; the Pont du Gard, one of the most impressive surviving examples of a massive masonry multiple-piered conduit, spanned the Gardon river-valley some 48.8 m (160 ft) above the Gardon itself. Where particularly deep or lengthy depressions had to be crossed, inverted siphons could be used, instead of arched supports; the conduit fed water into a header tank, which fed it into pipes. The pipes crossed the valley at lower level, supported by a low "venter" bridge, then rose to a receiving tank at a slightly lower elevation. This discharged into another conduit; the overall gradient was maintained. Siphon pipes were usually made of soldered lead, sometimes reinforced by concrete encasements or stone sleeves. Less often, the pipes themselves were stone or ceramic, jointed as male-female and sealed with lead. Vitruvius describes the construction of siphons and the problems of blockage, blow-outs and venting at their lowest levels, where the pressures were greatest. Nonetheless, siphons were versatile and effective if well-built and well-maintained. A horizontal section of high-pressure siphon tubing in the Aqueduct of the Gier was ramped up on bridgework to clear a navigable river, using nine lead pipes in parallel, cased in concrete. Modern hydraulic engineers use similar techniques to enable sewers and water pipes to cross depressions. At Arles, a minor branch of the main aqueduct supplied a local suburb via a lead siphon whose "belly" was laid across a riverbed, eliminating any need for supporting bridgework. Roman aqueducts required a comprehensive system of regular maintenance. The "clear corridors" created to protect the fabric of underground and overground conduits were regularly patrolled for unlawful ploughing, planting, roadways and buildings. Frontinus describes the penetration of conduits by tree-roots as particularly damaging. The aqueducts conduits would have been regularly inspected and maintained by working patrols, to reduce algal fouling, repair accidental breaches, to clear the conduits of gravel and other loose debris, and to remove channel-narrowing accretions of calcium carbonate in systems fed by hard water sources. Inspection and access points were provided at regular intervals on the standard, buried conduits. Accretions within syphons could drastically reduce flow rates, due to the already narrow diameter of their pipes. Some had sealed openings that might have been used as rodding eyes, possibly using a pull-through device. In Rome, where a hard-water supply was the norm, mains pipework was shallowly buried beneath road kerbs, for ease of access; the accumulation of calcium carbonate in these pipes would have necessitated their frequent replacement. The aqueducts were under the overall care and governance of a water commissioner (curator aquarum). It was a high status, high-profile appointment. In 97, Frontinus served both as consul and as curator aquarum, under the emperor Nerva. Little is known of the day-to-day business of aqueduct maintenance teams (aquarii). Under the emperor Claudius, Rome's contingent of imperial aquarii comprised a familia aquarum of 700 persons, both slave and free, funded through a combination of Imperial largesse and water taxes. They were supervised by an Imperial freedman, who held office as procurator aquarium. Theirs was probably a never-ending routine of patrol, inspection and cleaning, punctuated by occasional emergencies. Full closure of any aqueduct for servicing would have been a rare event, kept as brief as possible, with repairs preferably made when water demand was lowest, which was presumably at night. The water supply could be shut off at its aqueduct outlet when small or local repairs were needed, but substantial maintenance and repairs to the aqueduct conduit itself required the complete diversion of water at any point upstream or at the spring-head itself. Urban distribution tank at Nîmes, France. Circular section pipes radiate from a central reservoir, fed by a square-sectioned aqueduct. Aqueduct mains could be directly tapped, but they more usually fed into public distribution terminals, known as castella aquae, which supplied various branches and spurs, usually via large-bore lead or ceramic pipes. Thereafter, the supply could be further subdivided. Licensed, fee-paying private users would have been registered, along with the bore of pipe that led from the public water supply to their private property – the wider the pipe, the greater the flow and the higher the fee. Tampering and fraud to avoid or reduce payment were commonplace; methods included the fitting of unlicensed outlets, additional outlets, and the illegal widening of lead pipes; any of which might involve the bribery or connivance of unscrupulous aqueduct officials or workers. Official lead pipes carried inscriptions with information on the pipe's manufacturer, its fitter, and probably on its subscriber and their entitlement. During the Imperial era, lead production became an Imperial monopoly, and the granting of rights to draw water for private use from state-funded aqueducts was made an imperial privilege. Rome's first aqueduct (312 BC) discharged at very low pressure and at a more-or-less constant rate in the city's main trading centre and cattle-market, probably into a low-level, cascaded series of troughs or basins; the upper for household use, the lower for watering the livestock traded there. Most Romans would have filled buckets and storage jars at the basins, and carried the water to their apartments; the better off would have sent slaves to perform the same task. The outlet's elevation was too low to offer any city household or building a direct supply; the overflow drained into Rome's main sewer, and from there into the Tiber. At this time, Rome had no public baths. The first were probably built in the next century, based on precursors in neighboring Campania; a limited number of private baths and small, street-corner public baths would have had a private water supply, but once aqueduct water was brought to the city's higher elevations, large and well-appointed public baths were built throughout the city, and drinking water was delivered to public fountains at high pressure. Public baths and fountains became distinctive features of Roman civilization, and the baths in particular became important social centres. The majority of urban Romans lived in multi-storeyed blocks of flats (insulae). Some blocks offered water services, but only to tenants on the more expensive, lower floors; the rest would have drawn their water gratis from public fountains. Between 65 and 90% of the Roman Empire's population was involved in some form of agricultural work. Farmers whose villas or estates were near a public aqueduct could draw, under license, a specified quantity of aqueduct water for summer irrigation at a predetermined time; this was intended to limit the depletion of water supply to users further down the gradient, and help ensure a fair distribution among competitors at the time when water was most needed and scarce. Water was possibly the most important variable in the agricultural economy of the Mediterranean world. Roman Italy's natural water sources – springs, streams, rivers and lakes – were unevenly distributed across the landscape, and water tended to scarcity when most needed, during the warm, dry summer growing season. Columella recommends that any farm should contain a spring, stream or river; but acknowledges that not every farm did. Farmland without a reliable summer water-source was virtually worthless. During the growing season, the water demand of a "modest local" irrigation system might consume as much water as the city of Rome; and the livestock whose manure fertilised the fields must be fed and watered all year round. At least some Roman landowners and farmers relied in part or whole on aqueduct water to raise crops as their primary or sole source of income but the fraction of aqueduct water involved can only be guessed at. More certainly, the creation of municipal and city aqueducts brought a growth in the intensive and efficient suburban market-farming of fragile, perishable commodities such as flowers (for perfumes, and for festival garlands), grapes, vegetables and orchard fruits; and of small livestock such as pigs and chickens, close to the municipal and urban markets. A licensed right to aqueduct water on farmland could lead to increased productivity, a cash income through the sale of surplus foodstuffs, and an increase in the value of the land itself. In the countryside, permissions to draw aqueduct water for irrigation were particularly hard to get; the exercise and abuse of such rights were subject to various known legal disputes and judgements, and at least one political campaign; in the early 2nd century BC Cato tried to block all unlawful rural outlets, especially those owned by the landed elite - "Look how much he bought the land for, where he is channeling the water!" - during his censorship. His attempted reform proved impermanent at best. Though illegal tapping could be punished by seizure of assets, including the illegally watered land and its produce, this law seems never to have been used, and was probably impracticable; food surpluses kept prices low. Grain shortages in particular could lead to famine and social unrest. Any practical solution must strike a balance between the water-needs of urban populations and grain producers, tax the latter's profits, and secure sufficient grain at reasonable cost for the Roman poor (the so-called "corn dole") and the army. Rather than seek to impose unproductive and probably unenforcable bans, the authorities issued individual water grants (though seldom in rural areas) and licenses, and regulated water outlets, with variable success. In the 1st century AD, Pliny the Elder, like Cato, could fulminate against grain producers who continued to wax fat on profits from public water and public land. Some landholders avoided such restrictions and entanglements by buying water access rights to distant springs, not necessarily on their own land. A few, of high wealth and status, built their own aqueducts to transport such water from source to field or villa; Mumius Niger Valerius Vegetus bought the rights to a spring and its water from his neighbour, and access rights to a corridor of intervening land, then built an aqueduct of just under 10 kilometres, connecting the springhead to his own villa. The senatorial permission for this "Aqua Vegetiana" was given only when the project seemed not to impinge on the water rights of other citizens. Some aqueducts supplied water to industrial sites, usually via an open channel cut into the ground, clay lined or wood-shuttered to reduce water loss. Most such leats were designed to operate at the steep gradients that could deliver the high water volumes needed in mining operations. Water was used in hydraulic mining to strip the overburden and expose the ore by hushing, to fracture and wash away metal-bearing rock already heated and weakened by fire-setting, and to power water-wheel driven stamps and trip-hammers that crushed ore for processing. Evidence of such leats and machines has been found at Dolaucothi in south-west Wales. Mining sites such as Dolaucothi and Las Medulas in northwest Spain show multiple aqueducts that fed water from local rivers to the mine head. The channels may have deteriorated rapidly, or become redundant as the nearby ore was exhausted. Las Medulas shows at least seven such leats, and Dolaucothi at least five. At Dolaucothi, the miners used holding reservoirs as well as hushing tanks, and sluice gates to control flow, as well as drop chutes for diversion of water supplies. The remaining traces (see palimpsest) of such channels allows the mining sequence to be inferred. A number of other sites fed by several aqueducts have not yet been thoroughly explored or excavated, such as those at Longovicium near Lanchester south of Hadrian's wall, in which the water supplies may have been used to power trip-hammers for forging iron. At Barbegal in Roman Gaul, a reservoir fed an aqueduct that drove a cascaded series of 15 or 16 overshot water mills, grinding flour for the Arles region. Similar arrangements, though on a lesser scale, have been found in Caesarea, Venafrum and Roman-era Athens. Rome's Aqua Traiana drove a flour-mill at the Janiculum, west of the Tiber. A mill in the basement of the Baths of Caracalla was driven by aqueduct overspill; this was but one of many city mills driven by aqueduct water, with or without official permission. A law of the 5th century forbade the illicit use of aqueduct water for milling. A portion of the Eifel Aqueduct, Germany, built in 80 AD. Its channel is narrowed by an accretion of calcium carbonate, accumulated through lack of maintenance. Through the middle of the city runs a river, which the Romans brought there with great labour and set in their midst, and this is the Tiber. They made a new bed for the river, so it is said, of lead, and channels at one and the other end of the city for its entrances and exits, both for watering horses and for other services convenient to the people, and anyone entering it at any other spot would be drowned. During the Renaissance, the standing remains of the city's massive masonry aqueducts inspired architects, engineers and their patrons; Pope Nicholas V renovated the main channels of the Roman Aqua Virgo in 1453. Many aqueducts in Rome's former empire were kept in good repair. The 15th-century rebuilding of aqueduct at Segovia in Spain shows advances on the Pont du Gard by using fewer arches of greater height, and so greater economy in its use of the raw materials. The skill in building aqueducts was not lost, especially of the smaller, more modest channels used to supply water wheels. Most such mills in Britain were developed in the medieval period for bread production, and used similar methods as that developed by the Romans with leats tapping local rivers and streams. ^ Cited by Quilici, Lorenzo (2008). "Land Transport, Part 1: Roads and Bridges" in Oleson, John Peter (ed. ): The Oxford Handbook of Engineering and Technology in the Classical World. Oxford University Press. New York. ISBN 978-0-19-518731-1. pp. 551–579 (552). ^ Mays, L. (editor). Ancient Water Technologies. Springer. 2010. pp. 115–116. ^ Gargarin, M. and Fantham, E. (editors). The Oxford Encyclopedia of Ancient Greece and Rome, Volume 1. Oxford University Press. 2010. pp. 144–145. ^ Cynthia Bannon, Gardens and Neighbors: Private Water Rights in Roman Italy. University of Michigan Press, 2009, pp. 65–73. ^ The Roman general and hydraulic engineer Frontinus later calculated its delivery at 1825 quinariae (75,537 cubic meters) in 24 hours; see Samuel Ball Platner (1929, as completed and revised by Thomas Ashby): A Topographical Dictionary of Ancient Rome. London: Oxford University. p. 29. ^ Sextus Julius Frontinus. The Aqueducts of Rome. pp.1, 6–20. ^ a b The Aqua Alsietina was also known as "Aqua Augusta"; Frontinus distinguishes its "unwholesome" supply from the "sweet waters" of the Aqua Augusta that fed into the Aqua Marcia. On the one hand, he says the Naumachia's supply is "nowhere delivered for consumption by the people... [but the surplus is allowed] to the adjacent gardens and to private users for irrigation". On the other hand, "It is customary, however, in the district across the Tiber, in an emergency, whenever the bridges are undergoing repairs and the water supply is cut off from this side of the river, to draw from Alsietina to maintain the flow of the public fountains." Frontinus, The Aqueducts of Rome 1, 6–20. ^ CARON, André. "THE AQUEDUCTS". www.maquettes-historiques.net. Retrieved 17 September 2017. ^ Hodge, A. Trevor, Roman Aqueducts and Water Supply, Duckworth Archaeology, 2002, pp. 255 – 6, and note 43. ^ "Aqueducts: Quenching Rome's Thirst". 2016-11-15. Retrieved 2016-11-18. ^ Historical and Archaeological Context Constantinople and the longest Roman aqueduct Accessed August 28, 2016. ^ Mays, L., (Editor), Ancient Water Technologies, Springer, 2010. p. 116. ^ Taylor, R. (2012). Rome's Lost Aqueduct. (Cover story). Archaeology, 65(2), 34–40. ^ Delile, Hugo; Blichert-Toft, Janne; Goiran, Jean-Philippe; Keay, Simon; Albarède, Francis (6 May 2014). "Lead in ancient Rome's city waters". Proceedings of the National Academy of Sciences. 111 (18): 6594–6599. Bibcode:2014PNAS..111.6594D. doi:10.1073/pnas.1400097111. PMC 4020092. PMID 24753588 – via www.pnas.org. ^ Hodge, A. Trevor, Roman Aqueducts and Water Supply, Duckworth Archaeology, 2002. pp. 93–4. ^ Hodge, A. Trevor, Roman Aqueducts and Water Supply, Duckworth Archaeology, 2002. p. 2. ^ Mays, L., (Editor), Ancient Water Technologies, Springer, 2010. p. 119. ^ H. Chanson, "Hydraulics of Roman Aqueducts: Steep Chutes, Cascades, and Drop Shafts," American Journal of Archaeology, Vol. 104 No. 1 (2000). 47-51. ^ Hodge, A. Trevor, Roman Aqueducts and Water Supply, Duckworth Archaeology, 2002. pp. 110 – 11. ^ Mays, L., (Editor), Ancient Water Technologies, Springer, 2010. p.120. ^ Taylor, R., Public Needs and Private Pleasures: Water Distribution, the Tiber River and the Urban Development of Ancient Rome (Studia Archaeologica), L'ERMA di BRETSCHNEIDER, 2000, pp. 30-33, for calcined accretions and replacement of pipework. Water regulations prescribed a 5 foot distance between buildings and mains piping; an urban version of the protective "corridors" afforded to aqueducts. ^ Hodge, A. Trevor, Roman Aqueducts and Water Supply, Duckworth Archaeology, 2002; debris and gravel, pp. 24−30, 275: calcium carbonate, pp. 2, 17, 98: apertures in pipes as possible rodding eyes, p. 38. ^ Hodge, A. Trevor, Roman Aqueducts and Water Supply, Duckworth Archaeology, 2002, pp. 291−298, 305−311, and footnotes. ^ H B Evans, Water Distribution in Ancient Rome: The Evidence of Frontinus, University of Michigan Press, 1997, pp. 41−43, 72. ^ Hodge, A. Trevor, Roman Aqueducts and Water Supply, Duckworth Archaeology, 2002, pp. 3, 5, 49. ^ Cynthia Bannon, Gardens and Neighbors: Private Water Rights in Roman Italy. University of Michigan Press, 2009, pp. 5−10; citing Hodge, Roman Aqueducts, pp. 246 – 247 for estimate on water consumption by irrigation. ^ Cynthia Bannon, Gardens and Neighbors: Private Water Rights in Roman Italy. University of Michigan Press, 2009, pp. 5−10; citing Hodge, Roman Aqueducts, pp. 246−247 for estimate on water consumption by irrigation; p. 219 for Cato's legislation on misuse of water: the quotation is from Cato's speech against L. Furius Purpureus, who was consul in 196 BC. ^ Cynthia Bannon, Gardens and Neighbors: Private Water Rights in Roman Italy. University of Michigan Press, 2009, p. 73. ^ Wilson, Andrew (2002): "Machines, Power and the Ancient Economy", The Journal of Roman Studies, Vol. 92, pp. 1–32 (21f. ), p. 21f. ^ Lewis, M.J.T., "Millstone and Hammer: the Origins of Water Power", Hull Academic Press, 1998, Section 2. ^ Gross, Hanns (1990). Rome in the Age of Enlightenment: the Post-Tridentine syndrome and the ancien regime. New York: Cambridge University Press. p. 28. ISBN 0-521-37211-9. Blackman, Deane R., Hodge, A. Trevor (2001). "Frontinus' Legacy". University of Michigan Press. Bossy, G.; G. Fabre, Y. Glard, C. Joseph (2000). "Sur le Fonctionnement d'un Ouvrage de Grande Hydraulique Antique, l'Aqueduc de Nîmes et le Pont du Gard (Languedoc, France)" in Comptes Rendus de l'Académie des Sciences de Paris. Sciences de la Terre et des Planètes. Vol. 330, pp. 769–775. Chanson, H. (2002). "Certains Aspects de la Conception hydraulique des Aqueducs Romains". Journal La Houille Blanche. No. 6/7, pp. 43–57. Coarelli, Filippo (1989). Guida Archeologica di Roma. Milano: Arnoldo Mondadori Editore. Claridge, Amanda (1998). Rome: An Oxford Archaeological Guide. New York: Oxford University Press. Fabre, G.; J. L. Fiches, J. L. Paillet (2000). L'Aqueduc de Nîmes et le Pont du Gard. Archéologie, Géosystème, Histoire. CRA Monographies Hors Série. Paris: CNRS Editions. Gebara, C.; J. M. Michel, J. L. Guendon (2002). "L'Aqueduc Romain de Fréjus. Sa Description, son Histoire et son Environnement", Revue Achéologique de Narbonnaise, Supplément 33. Montpellier, France. Leveau, P. (1991). "Research on Roman Aqueducts in the Past Ten Years" in T. Hodge (ed. ): Future Currents in Aqueduct Studies. Leeds, UK, pp. 149–162. Lewis, P. R.; G. D. B. Jones (1970). "Roman gold-mining in north-west Spain". Journal of Roman Studies 60 : 169-85. Lewis, P. R.; G. D. B. Jones (1969). "The Dolaucothi gold mines, I: the surface evidence". The Antiquaries Journal, 49, no. 2: 244–72. Taylor, R., Public Needs and Private Pleasures: Water Distribution, the Tiber River and the Urban Development of Ancient Rome, (Studia Archaeologica) L'ERMA di BRETSCHNEIDER, 2000. Tucci, Pier Luigi (2006). "Ideology and technology in Rome’s water supply: castella, the toponym AQVEDVCTIVM, and supply to the Palatine and Caelian hill". Journal of Roman Archaeology 19 : 94-120. Wikimedia Commons has media related to Ancient Roman aqueducts. Sextus Julius Frontinus. De Aquaeductu Urbis Romae (On the water management of the city of Rome). Translated by R. H. Rodgers. University of Vermont. 2003. Hubert Chanson – A dozen freely available published research articles on Roman aqueduct hydraulics and culvert design, and related topics by Professor Hubert Chanson, Department of Civil Engineering, University of Queensland. John Hooper, Secrets of Roman aqueduct lie in chapel. The Guardian. 24 January 2010.